We usually pride ourselves at being at the forefront of new music, but it does sometimes occur that some really great music slips through the cracks. Likely we miss things all together (not surprising given the amount of music output these days), while other times we do eventually “catch up” to releases from months ago. Discovering Rodney Cromwell is a case in point. His Age of Anxiety LP came out in early summer of 2015 and his Black Dog EP in late autumn. These releases were warmly welcomed by the likes of the BBC, Spain’s national Radio 3, and numerous great publications, such as Electronic Sound Magazine and NME. Today we are pleased to join this ever-growing list of blogs and such that have discovered and are now spreading the word about Rodney Cromwell’s music. We recently indulged in this interview with him. Can you tell us a bit about your music and influences? I make what has been described as lo-fi, indie synth-pop, which is pretty accurate as my album Age of Anxiety was recorded in our spare bedroom using a collection of knackered analogue synthesizers. You can’t get much more lo-fi, indie synth really! Sonically, it has been compared a lot to Kraftwerk and New Order, which is reasonable because they are two acts that have influenced my sound for a long time. While making the record, however, I was inspired by a whole mix of things, from left-field stuff like Polyrock, Section 25, Ulrich Schnauss all the way through to pop artists like Stromae, Carice Van Houten, and Lady Gaga. I’m probably the only person who can hear all those influences though. That’s really an eclectic array of influences. Anyway, to get you know better, let’s clarify one thing – Rodney’s not your real name is it? No not at all. My real name is Adam Cresswell. About three people remember me from the indie band Saloon and back then I was known as “Adam Saloon”. After that I was in Arthur and Martha and everyone called me “Arthur”. So Rodney Cromwell feels like my third stage name. Although technically a solo album, I didn’t want to use my real name. Rodney Cromwell is not exactly a rock-star name like Ziggy Stardust or The Edge, but it does give an additional layer of enigma and performance. It also stops me getting too many LinkedIn requests from strangers! We heard that you played the recent Electro London show and that, despite not being the headliner, you actually stole the show. Was this the case? It was a great night in that everything really came together for the band and me. From what I can tell, we have one of the more complex set-ups on the synth scene. We have live guitar, bass, two analogue synths, and a whole load of effects along with an over-worked computer – all of which have to be plugged in! On the Electro London night, we had a really good sound and the audience were really receptive, so that gave us the confidence to push the sonics and really enjoy ourselves. I genuinely try not to pay too much attention to what reviews say. What I have seen said about our set has been really positive, but I don’t like the idea of “stealing the show”. The headliners Massive Ego gave one of the most outlandish and entertaining performances that I’ve seen in a long time. I don’t view music as a competitive thing; I’m much more interested in a collaborative approach. All I really want to do is play well and hope a few people like it enough to buy the album; everything else is ephemeral. Have you ever collaborated with any artists under your new stage name Rodney Cromwell? Can you tell us something about this? I’ve only really been releasing stuff under the name Rodney Cromwell for about a year so there hasn’t been a great amount of time for collaborations. I have managed to fit in a remix for the Canadian band Meter Bridge, which was cool, and at the moment I am working on a remix for The Leaf Library, who are a lovely indie band from London. I’m also putting out on my label Happy Robots a 7” by Hologram Teen, which is the new act of Morgane Lhote, who used to be in Stereolab and The Projects. It’s a great record. I can’t wait for people to hear it! Excellent. So 2016 will be just as smashing as 2015 was for you. Last year, you released both an LP and then an EP. What was the inspiration to put out a second release so close to the first release? After the album came out, the obvious thing to do was to put out a single. One of the most popular tracks was “Black Dog”, so we edited and tidied it and it sounded great. It then seemed a good idea to try out an old-school 12” mix too. With the album track “You Will Struggle”, I always thought it would be cool to dig deeper into its “retro-trance” aspect, so that became the “Glitchy Disco Mix”. And then my brother and production partner Dom Cresswell did an interesting reworking of “Barry was an Arms Dealer”, so we stuck that on. Before we knew it, we had a four-track EP. It was no big deal. I do think people have become so accustomed to singles being padded out with tracks straight off an album or second-rate remixes, but to me it was just about trying out new ideas and putting out a quality product that doesn’t rip anyone off. That’s really cool. Given that you’ve worked with a lot of artists a few times and engage your brother, we assume that the synth-pop community is quite small. Is that indeed the case? Are some countries more “progressive” than others in this respect? I really couldn’t tell you, as it is not a community that I have been a part of for very long. With the globalization of music through the internet, sometimes I’ll be chatting to someone in another band and I haven’t a clue whether they are from Croydon or Croatia. I read a lot about how Sweden is one of the more progressive countries for synth-pop. I have always found that Sweden was massively progressive in terms of music, culture, and fashion across the spectrum. Certainly when I toured Sweden in Saloon, we were probably the five least cool people in the venues each night. Even the people doing our sound looked way cooler than us. What is the high point of your “real life” as Rodney Cromwell? That’s a difficult question because in one year there have been plenty of high points already. Supporting one of my favourite bands DEATH AND VANILLA was definitely a highlight as was playing the Indietracks festival in Summer 2015. That was only our second proper show, and there were people singing along and cheering when song titles were announced – that’s what it’s all about! The very best part though has just been meeting some cool new people and hanging out with Alice and Richard who have been in the Rod Cromwell band over the last year. Obviously I don’t make enough money to pay them session rates, so I’m massively appreciative that they have been there for me. It has been a lot of fun. What would you say is the high point of your “virtual life” (i.e. social networks, online radio, etc.) as Rodney Cromwell? Well the reaction has been brilliant, for which I am eternally grateful. In December, when “Best of 2015” lists were being shared, there was a lot of punching-the-air in Rod Cromwell Towers. Getting a positive reaction did take a long time though. In fact, just before the album came out, I really thought it could be the biggest flop of my career. Although I am thankful for any exposure (good or bad), the highlights for me were probably coverage from The Electricity Club website and Electronic Sound Magazine because they were publications that I was already a regular reader. Their exposure certainly opened doors and gave me the push to get out there and flog the record to death, which is a part of the business that I’ve never really cared for before. Besides your own music, what is the last EP or LP you listened to and actually enjoyed? I’ve been eating up everything on Bandcamp by the band Battery Operated Orchestra, which is the new(ish) act of Chris who was in the equally great band Katsen. Every track I’ve heard by them is brilliant. If I won big on the lottery, I would absolutely offer them a deal on my label, although they probably have better offers coming in. I am going to gigs by SECTION 25 and CHVRCHES over the next few weeks, so I’ve been reacquainting myself with their most recent releases too. Malcolm Holmes from legendary pop group Orchestral Manoeuvres In the Dark has praised your work and that, more recently, Visage member now-turned-DJ Rusty Egan has come on board as a supporter. What is it like to be the object of such affection by such key pioneers in the field of synth-based music? Ha ha! It’s great, of course, and it seems a bit crazy that people who are so influential and pioneering would be interested in what I do. I am expecting to get a cease-and-desist in the post from Peter Hook any day now! Ha ha! As you can tell from my press shots, I’m really not that cool or glamorous, so hearing that the guy who started the Blitz Club (editor’s note: Rusty Egan) likes what I do is amazing. 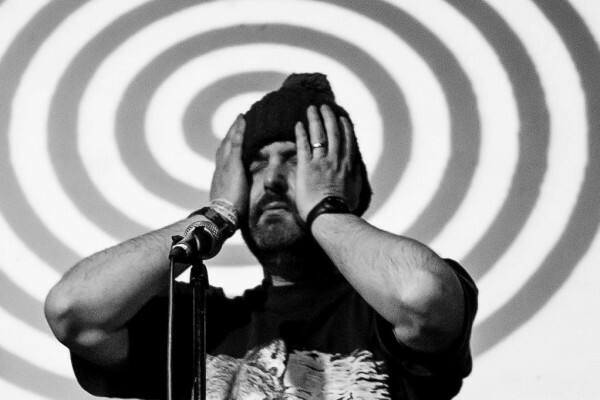 People probably don’t realise that when I’m not making music, I’m working a mundane office job, changing nappies, repainting the shed, stuff like that – no-one gets to see that side of the Rodney Cromwell experience thankfully. Any other bands that you, in your turn, would also like to commend? I really like this guy from Canada called Gabe Knox. I know nothing about him at all, but he has a really great EP of electronic / krautrock stuff on Bandcamp. Also Ummagma from Canada. I’m looking forward to hearing what Alice does next with her band Cosines because I know they are working on a new EP. I think Andrew from Real Experts is one of the nicest guys I’ve met on the synth scene, and hopefully we will sort out doing a show together sometime. I’ve been enjoying the recent Circuit3 album a lot, too, and, as I type, I am very much enjoying the Cavern of Anti-Matter album. How is 2016 treating you so far? Any planned projects or gigs coming up that you can tell us about? My foot is still firmly on the pedal. I hope to put out another EP at some point. Gig bookings are coming in too. I’m playing the Threshold Festival in Liverpool on April 2nd, which should be a lot of fun. And I’ll be playing Synthetic City in Birmingham on April 23rd. I’ve not played in Birmingham since the Arthur & Martha days, so I’m very much looking forward to playing a good gig and having a decent curry before hand. If you’ve read this far and you are in the UK in April, it would be great to see you at one of the shows!